CPM are an Electro -Mechanical Service Company based in Manchester UK and who support many large manufacturing and service companies with proactive and reactive repairs to rotating machines both nationally and internationally. So, knowing what triggers a customer to outsource maintenance is fundamental to shape the service delivery that CPM should deliver. Loyalty comes after, when you keep the promise, consistently. 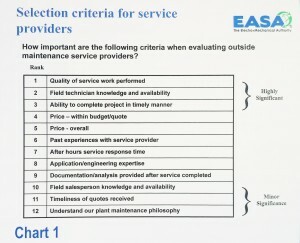 So, what criteria do end-users use to evaluate possible vendors, when deciding to outsource any maintenance service? 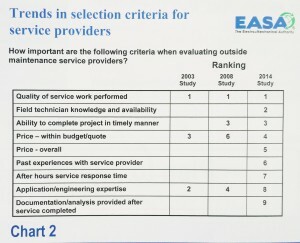 It should come as no surprise that the factor most important to end-users when selecting an outside maintenance service provider is “the quality of the service performed”. Other important criteria to end-users include their evaluation of the outside service provider’s “technical knowledge and availability” and their “ability to complete the project in timely manner”. In reviewing these replies, it is clear that end-users chose outside maintenance service providers based upon their experience and reputation. Hence, it is important to be able to describe and demonstrate your past service work in terms of quality, technical knowledge, and timeliness. Are these end-user criteria changing? Allowing the opportunity to determine if attitudes and practices have changed over time, these criteria were also examined in the earlier EASA industry research studies (2003 and 2008). 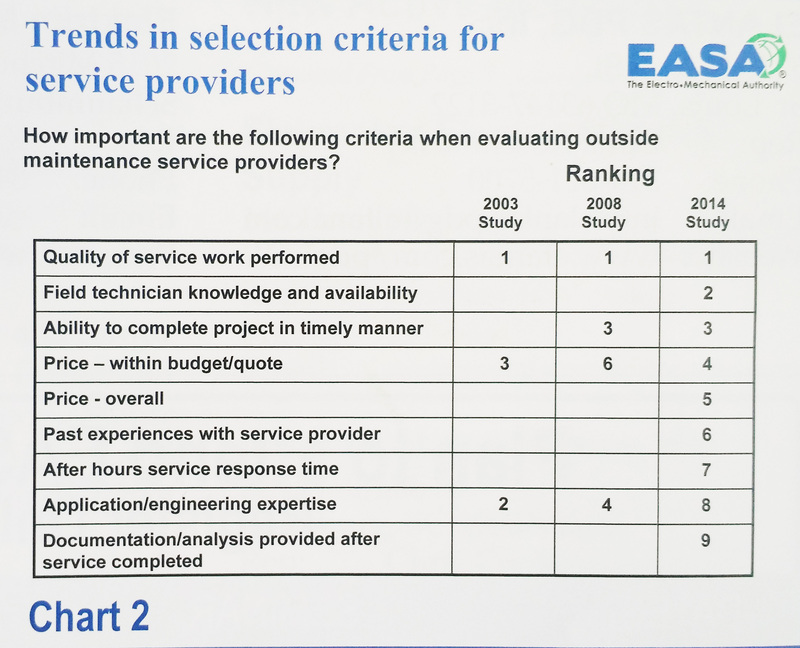 Looking at the findings in earlier EASA industry research in Chart 2, “quality of work performed” consistently ranks as the most important issue. In these earlier studies, the variety of criteria considered by end-users was more limited. However, there is no question about the most important factor – quality of service work performed. Surprisingly perhaps, the most recent study showed price to be a secondary issue, and obviously linked to 3rd top criteria. As noted on Chart 2 one dimension of price is the service provider’s ability to deliver the maintenance services within the quoted price. Hence, doing a good job of developing an accurate quote that identifies the various factors or uncertainties that influence pricing, is perhaps just as important as the actual price billed for the services provided. So what is it that triggers you? Would you rate your existing supplier with “10 out of 10” on all criteria? If not, give call us on 0161 865 6161 or email us at info@cpm-uk.com and let us tell you about our loyal customers.